KIEV, Ukraine -- As the snow and ice began to melt in Ukraine this spring, exposing fresh cracks and potholes in the roads, hundreds of motorists gathered outside a government building carrying unusual burdens. 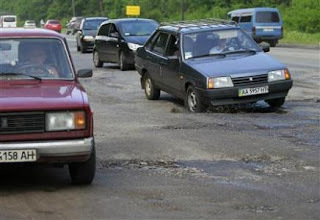 Cars drive over a pothole along a road near Kiev May 16, 2013. They laid them down like funeral wreaths -- torn-off bumpers, crushed shock absorbers and ruptured tires -- demanding those inside the building, the state roads agency, carry out urgent road repairs and threatening to sue them for damages. In many ways, the problems with Ukraine's roads encapsulate the country's political and economic dilemmas more than two decades after the collapse of the Soviet Union. Most drivers blame the government for the fact that potholes and crumbling asphalt mean they either have to endure incessant jolts and regular damage by steering straight over them, or zig-zag around them, with perilous consequences. In fact, the government does spend on the roads. Like the heavily subsidized energy and utilities sectors, Ukraine's state-run road network drains billions of dollars a year. But most is swallowed up by corruption, mis-spending and short-term repairs, leaving the authorities with the choice of raising taxes to cover the soaring costs or cracking down. It is just one of several tough decisions the government needs to make to avoid a debt trap, but it is refusing to countenance for fear of losing popularity. State debt rose to $67.4 billion this March from $60.5 billion a year earlier. "All the government efficiency issues manifest themselves in the road sector," said Mark Magaletsky, senior banker in charge of Ukrainian infrastructure and energy at the European Bank for Reconstruction and Development. Far bigger protests are held regularly in Ukraine, where President Viktor Yanukovich's opponents accuse him of encouraging the judiciary to jail rivals like ex-prime minister Yulia Tymoshenko and failing to pursue his declared goal of European integration. But the motorists' demonstration seemed to have triggered a flurry of activity. Prime Minister Mykola Azarov has repeatedly raised the issue at public government meetings and on his Facebook page, saying Ukraine's 46 million people simply do not pay enough taxes to cover the cost of road maintenance. Road works are mostly financed by an excise tax on gasoline and other car fuels, with Ukrainians paying 1.57 hryvnias (about $0.2) in tax per liter of 95 Octane gasoline, less than a third of the level in Germany. Andreas Schliessler, transport program team leader at the World Bank for Ukraine and its neighbors, agrees underfinancing is a concern, despite progress made by Kiev in the last decade. "Government has substantially increased the fuel excise tax rates," Schliessler said in emailed comments. However, it still needs to double road funding to match the level of developed economies, he said. "Road conditions would certainly be better if Ukraine would spend the same proportion of GDP on roads," Schliessler said. Under President Viktor Yanukovich, Ukraine raised the excise tax by about 50 percent between 2010 and 2012. However, the rates have remained unchanged since early 2012 when his Party of the Regions started preparing for a parliamentary election. The government has compensated for the lack of funds by borrowing. Last year, Ukravtodor spent a third of its funds, or about $400 million, on servicing debt. This year, debt and interest payments are set to exceed $1 billion. Raising excise rates further would be an obvious solution, said Magaletsky from the EBRD. "Of course, this is a political issue and a tough one," he said. Ukraine is in talks with the International Monetary Fund on a $15 billion loan to help it service foreign debts of around $9 billion falling due this year. The Fund, though, is urging Kiev to raise heavily subsidized household gas and heating prices to cut its budget deficit, something the government is reluctant to do because the move is certain to be very unpopular with voters. The largest anti-government protests under Yanukovich were in late 2011, when the government introduced a new tax code, in effect raising taxes on millions of individual entrepreneurs. "If the government decides to raise excise rates ... nothing is going to save them," said a blog by local journalist Andriy Chernikov, who organized public protests and set up a Facebook group called "I hate Ukravtodor", the state roads agency's name. Chernikov, like many other Ukrainians, believes the problem lies more in the way funds are spent. The State Financial Inspection, a financial watchdog, said in February it had found multiple cases of abuse at Ukravtodor that cost the budget 225 million hryvnias ($28 million). The figure may have been higher if Ukrainian laws governing purchases of goods and services by the state did not have so many loopholes - enough for the European Union to refuse to provide aid to its state budget for the last two years. The loopholes, in particular, allow government bodies like Ukravtodor to bypass open tenders in certain cases and award lucrative contracts to companies of their choice. Wary of political risks, the government has quickly shot down the idea of raising fuel taxes floated by Infrastructure Minister Volodymyr Kozak last month. Energy Minister Eduard Stavytsky said he did not think raising excise rates would help road funding. "People will just drive less and this will affect tax collection." The prospect of raising taxes will only become more unpalatable with the approach of the next presidential election, due in early 2015, meaning the roads will continue to degrade. The same is likely to happen to other areas of infrastructure such as energy and utilities where prices paid by households are heavily subsidized and removing subsidies is certain to lead to popular discontent. "Unfortunately, imbalances are present in many sectors in Ukraine," the EBRD's Magaletsky said. "Everything related to price increases for households goes through with great difficulty and is highly politicized." Meanwhile, Ukrainians pay hidden "taxes" in the form of repair bills, insurance premiums and sometimes, writeoffs. The price can be steep; Ukrainian insurer ASKA said a car carrier truck's upper deck collapsed in March due to violent shaking on a bumpy road, crushing all the vehicles beneath.